Nancy's Nook : This month . 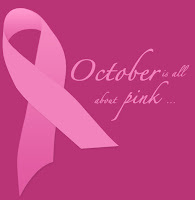 . .
is NATIONAL BREAST CANCER AWARENESS MONTH. I would be remiss if I did not take this opportunity to tell all of you out there: check your breasts! I even know of a MAN from Mission, TX (my hometown) who died of breast cancer. As you may know, my own twin, Peggy, was diagnosed with breast cancer at the age of 32 and died of it at the age of 37. The lump in her breast was pretty large, but she had not detected it on her own because she wasn't checking. She thought (and I thought) that she was too young to have to be checking. Some of you are more at risk than others (like Elizabeth, whose mother was Peggy, and Laura, whose mother's identical twin (with same DNA) was Peggy.) But EVERY WOMAN is at risk. And as I mentioned earlier, some men. The Susan G. Komen for the Cure, formerly known as The Susan G. Komen Breast Cancer Foundation, is an organization supporting breast cancer research. Since its inception in 1982, Komen has raised over $1 billion for research, education and health services, making it the largest breast cancer charity in the US. Komen has more than 75,000 volunteers nationwide — 122 affiliates in the United States (47 of 50 states) and 3 in other countries. Susan G. Komen for the Cure received Charity Navigator's highest rating, four stars. Susan G. Komen was a woman from Peoria, Illinois who was diagnosed with breast cancer at the age of 33 and died three years later, in 1980. Komen's younger sister, Nancy Brinker, feeling that Susan's outcome might have been better if patients knew more about cancer and its treatment, and remembering a promise to her sister that she would find a way to speed up breast cancer research, founded The Susan G. Komen Breast Cancer Foundation in Komen's memory in 1982. In 2007, the 25th anniversary of the organization, it changed its name to Susan G. Komen for the Cure, created a new logo, and adopted the explicit mission "to end breast cancer forever". Good post, Nancy, and important. Thanks.